THERE WAS A WHOLE LOT OF SHAKIN’ GOING ON at Vegas@50+ the annual AARP convention held this year in Las Vegas Oct. 22-24. Exhibitors filled the Sands Expo and Convention Center informational seminars educated attendees about financial security and health care and early morning workouts got hearts pumping as did the dance parties concerts and celebrity speakers. That was all business as usual for this annual extravaganza which has been growing steadily since its inception as a member event in 2001. (The only break occurred in 2005 when Hurricane Katrina hit New Orleans canceling the event.) 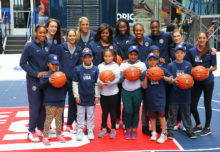 But this year AARP went digital with a virtual experience social networking sites an on-site TV show and bloggers proving that today’s 50-plus generation is turned on and tuned in to what’s hip including the Internet. 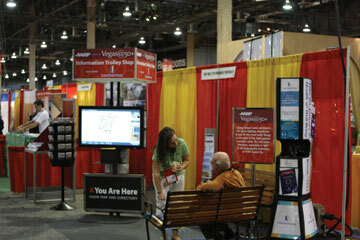 The virtual experience called You Are Here and developed by digital media technology company MarketArt lives on AARP’s website aarp.org and served as a pre-event primer offering links to a map of the exhibit show floor speakers entertainment and other activities. It will stay live for the entire year and three months after Vegas@50+ will transition into AARP’s next scheduled event which will take place next year in Orlando. 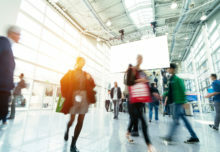 Besides the website the You Are Here system was distributed throughout the Sands’ 360 000 square-foot venue on touch-screen stations that helped attendees find their way to exhibitors products and services. It also extended the exhibitors’ reach and attracted traffic to their booths. A “crumb trail” tracking system allowed attendees to enter their badge number to see where they went and find key points of contact for each company they visited. An on-site TV show Channel 50+ also was new broadcasting programs filmed daily throughout the conference on closed-circuit TVs and on the AARP website. The programs featured exciting tidbits from the event and excerpts from the presentations; for example Irish tenor Ronan Tynan’s speaking and singing session or a day at the nearby Las Vegas Motor Speedway. The convention attracts a largely affluent college-educated audience with most attendees between the ages of 50 and 65. The average age of AARP members is 63 which Wismar says hasn’t changed much in the past few years. They boast an average household income of just over $91 000 and nearly half of AARP members are still working. 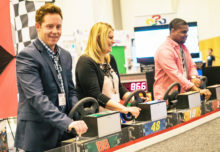 This tech-savvy demo is an attractive target to marketers who pay big bucks to sponsor their annual convention which includes naturally a technology café and a technology learning lab. Their support subsidizes the cost of the three-day event which this year remained at $25 for members and $35 for non-members which is a good deal in any age digital or otherwise.